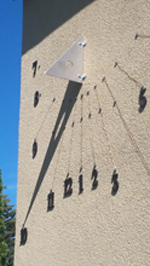 This vertical dial is mounted directly onto the stucco wall of the house. The gnomon is a triangle of aluminum cut from 3/16 inch sheet, with a 2-inch hole as a breather to relieve stress from cross winds. More interesting are the hour lines, made of a double strand of heavy copper wire, with each extending from winter to summer solstice, held with pegs (from Canadian Tire). A middle peg shows the equinox as well. Hour lines extend from 7am to 6pm, shown in simple Arabic numbers. The sundial is operational in clear weather from 8:30am - 6pm through all seasons.